Photographed on the Friday 20 May 2016. The beetle shown here is one of the family of click beetles (Elateridae) of which there are 73 known species in the UK and about 9 300 known species worldwide. This click beetle like all beetles belongs to the Class Insecta and Order Coleoptera, in particular it belongs to the family of click beetles known as the Family Elateridae and Genus Agriotes. 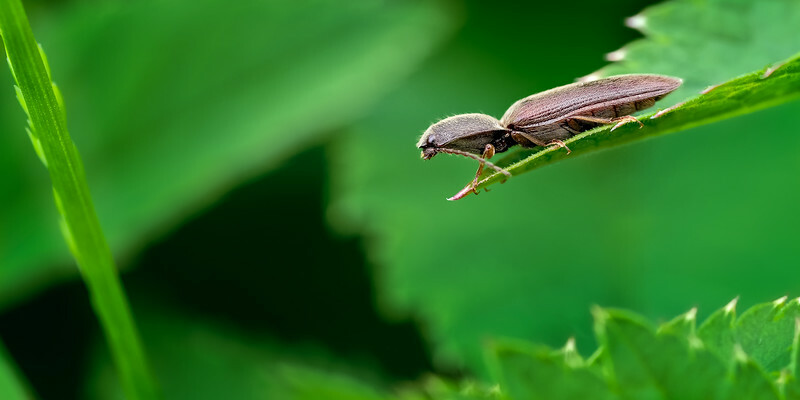 Click beetles are able to flex and flick their bodies up as a defensive and self-righting mechanism which produces an audible click, hence their name. Most with a few exceptions are quite drab in appearance. They are also known as elaters, snapping beetles, spring beetles and skipjacks. The adults are normally phytophagous (vegetarian) feeding mainly on grass, pollen and nectar and normally nocturnal. Their larvae on the other hand colloquially known as ‘wireworms’, are usually either saprophagous (feeding of dead organisms/organic matter) or feed on the roots of plants and may become serious crop pests. Some elaterid species can even be bioluminescent (Pyrophorus). Wireworms can spend 3 to 4 years of their life in the soil.